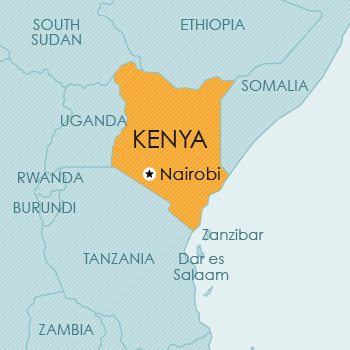 The Republic of Kenya lies on the Equator in East Africa. It is bordered by the Indian Ocean and Somalia to the east, Ethiopia and South Sudan to the north, Uganda to the west and Tanzania to the south. Kenya is a member of the Paris Convention, the Madrid Agreement and Protocol, and the WTO/TRIPS. Applications for the registration of trade marks may be filed as national applications, in appropriate circumstances, claiming priority in terms of the Paris Convention; or Kenya may be designated in international applications in terms of the Madrid Agreement/Protocol. Provision is made for the registration of trade marks for goods and services, for collective marks, certification marks, defensive registrations of well-known marks, and for series marks. The Act provides for registration of a mark in Part A of the register, where the mark must already have acquired distinctiveness; and for registration in Part B of the register, where the mark must only be capable of becoming distinctive. Kenya is a member of the Paris Convention, ARIPO (Harare Protocol) and the WTO/TRIPS. Design protection is available by way of a national filing, in appropriate circumstances with a claim to convention priority, or via an ARIPO application designating Kenya. Kenya has implemented the Harare Protocol (which regulates patent and design filings in ARIPO) in its national laws, thereby providing for valid design protection to applicants seeking to obtain a design registration via ARIPO. Kenya is a member of the Berne Convention, the Brussels Convention, the Phonograms Convention, and the WTO/TRIPS. Plant breeders’ rights can be obtained in Kenya under the Seeds and Plant Varieties Act, Chapter 326, Laws of Kenya. Kenya is a member of the UPOV Convention for the Protection of New Varieties of Plants. The effect of protection is that the plant breeder’s right holder has an exclusive right to produce reproductive material of the variety for commercial purposes, to offer it for sale, to export it, and to stock it for any of these purposes.